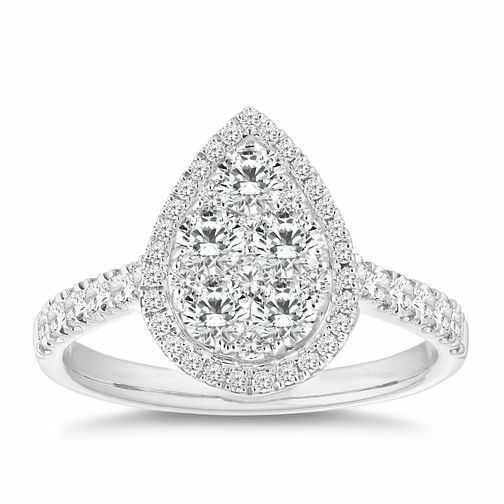 Captivate with this perfect pear cluster diamond ring. A breathtaking 1ct diamond is set with a cluster of round stones, sure to catch the light and attention. Sparkling shoulders complete this charming ring, beautifully crafted from 18ct white gold. 18ct White Gold 1ct Pear Cluster Diamond Ring is rated 4.9 out of 5 by 14. Rated 4 out of 5 by Anonymous from Missing diamonds I’m now on my third ring and diamonds continue to come loose! It’s very frustrating and it’s absolutely gorgeous and my partner did a great job choosing it! I don’t have a hands on job so there no reason for the diamonds to keep falling out. Disappointed! Rated 5 out of 5 by Anonymous from Beautiful! My partner proposed a month ago with this ring and it’s absolutely perfect.